Contemporary A frame | Camillus Homes | 3 bedroom in Onondaga - Contact Bob McTague at 315-882-6610 for more information about this home located in Camillus, New York. 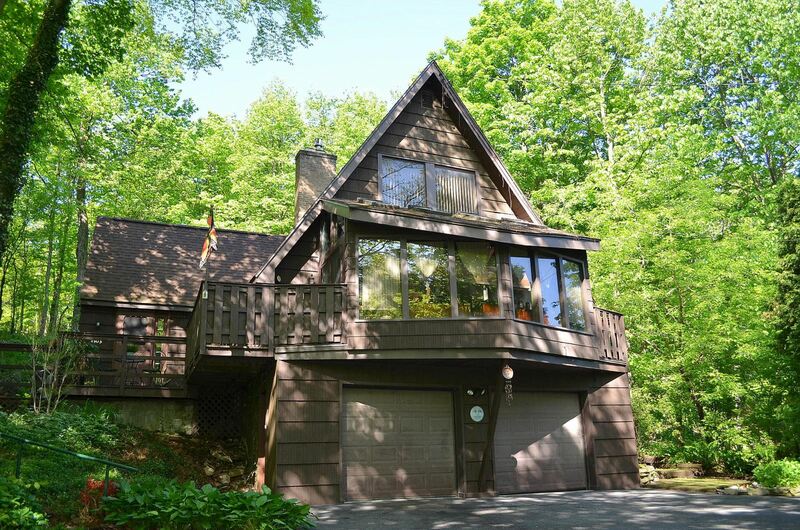 Camillus, NY Neighborhood - This amazing Contemporary "Arts & Crafts" style A-frame offers privacy on a wooded lot, yet centrally located to West Genesee schools, parks, shopping, hospitals, and major highways. First Floor Features - The first floor features a beautiful eat-in kitchen with hardwoods, wainscoting, and plenty of cabinet and counter space. Entertain in the impressive and open 2 story great room offering a floor to ceiling stone fireplace, a custom maple staircase, and an enclosed front porch which would make a great office or sun room. The main floor also provides 2 conveniently located bedrooms with new carpets and a full bath. Second Floor Features - The second floor offers a loft area and a private master bedroom with maple flooring, a custom bookcase, colonial base molding, and a deck overlooking the private yard. The master bathroom was completely renovated with new tile, floor to ceiling shower, and a custom vanity with a granite top. Basement - The updated finished basement provides a family room with a fireplace, new tile floors, a custom shelving unit, and a new half bath. Exterior – The exterior offers a 2 car garage, an oversized driveway and multi level decks to enjoy the outdoors.